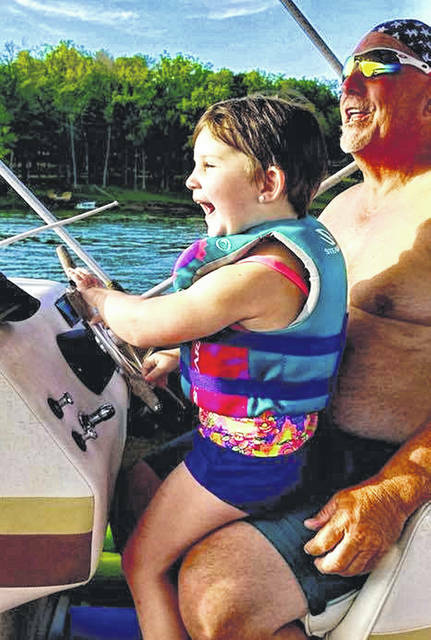 Presley Hoff is pictured boating with her grandfather, Brad Kidwell. Kayleesue Laber is a runner. When she runs, she often prays. Lately, she has been praying for the 4-year-old daughter of a former Hillsboro High School classmate who has a rare disease. What she is doing, with help from Danielle Koehler, Cindy Kidwell and others, is holding a 5K “color run” Saturday, Oct. 6 in the East Shore area at Rocky Fork State Park. The three-mile fun run starts at 8:30 a.m. Registration starts at 7:30 a.m. There will be multiple stations where volunteers will be splashing colors — mostly purple because that’s the color for epilepsy — on the runners. The event will be a benefit for Paws for Presley, an organization trying to raise $15,000 to purchase a service dog for 4-year-old Presley Hoff, the daughter of 2005 HHS graduate Nikki Kidder. Hoff has chiari malformation. In other words, her skull is too small and is forcing her brain out the bottom of the hole the spine is attached to, which causes epilepsy. Those issues significantly impact her balance, walking gait and cognitive function. The dog will apply deep pressure therapy for anxious situations, provide a counter balance for walking, shield her with its body if she falls, will be a tether support so she can’t run off, will search for her if she runs away, and will also help if Hoff has a seizure. “The quality of her life to have this dog would help her tremendously,” said Hoff’s grandmother, Hillsboro area resident Cindy Kidwell, who added that her granddaughter also has anxiety issues that the dog will help her overcome. Kidwell said Hoff is like most 4-year-olds, and that she loves horses, the outdoors and boating. The cost of the event is a recommended donation of $20, and those paying that amount receive a T-shirt. Snacks are being provided by Hunter Family Chiropractic in Hillsboro and water is being provided by Nutrien Ag Solutions. Kidwell said her daughter and granddaughter currently live in Wooster, but hope to move back to the Hillsboro area around the beginning the new year. They also hope to be at Saturday’s run. There have already been T-shirt sales and a motorcycle ride to help raise money for the dog. For more information contact Laber at 605-630-0995.
https://www.timesgazette.com/wp-content/uploads/sites/33/2018/10/web1_Paws-for-Presley-2.jpgPresley Hoff is pictured boating with her grandfather, Brad Kidwell.